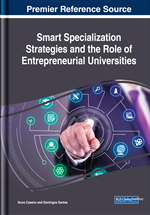 This chapter deliberates the significance of smart specialization strategy and its impact on regional development that enable a region to become more creative and innovative. Consistently, the emergence of smart specialization strategy is the cornerstone of creating a unique platform for enhancing territorial competitiveness and knowledge-driven innovation center through promoting entrepreneurial universities within the region connected to the regional growth scheme. Therefore, the authors investigate what makes regions competitive. What fosters growth in one region may be under a bottleneck effect in another. This chapter represents an accessible approach for identifying competitors and their particular circumstances that discuss regional entrepreneurial discovery process and their competitiveness from a conceptual perspective. In the era of industrialization, the appearance of smart specialization strategies salient approach has been recognized as an effective tool that acts as a vehicle for promoting regional economic development and stimulates entrepreneurship that creates regional value. The present dialogue on regional competitiveness, research and development strategy constitutes one of the most common policies approaches to address the strains between globalization and localization. The comprehensive perspective of this chapter is to illuminate the impression of smart specialization strategy (S3), as an effective mechanism for improving regional entrepreneurial competitiveness, and entrepreneurial discovery process (EDP); in order to highlight the significance of linking different firms, people, and knowledge at a regional level- are one of the ways of making regions, businesses more innovative and competitive. Therefore, the authors planned to present a unique purposeful framework that takes into account economically valued network relations between places of divergence regions. Where, it is underpinned with detailed analysis and the concept of competing economically valued relations between regions to develop smart specialization strategies that are essential in the place-based policy initiatives of the different European regions interconnection policy. Moreover, this emerging idea of smart specialization has now become a burning topic. It provides an enthusiastic and promising deliberate technique for academics, researchers, students and policy-makers that having a keen interest and urge to know the economics, especially applied regional economic studies, regional development, European studies and regional studies. Hence, this chapter will act as an elixir for the ground-breaking concept to the current academic discussion on regional knowledge development process that encouraged entrepreneurial universities, for regional, economic and social development, which is nowadays becomes the most important facilitators on smart specialization strategies innovative approaches. Equally, it is necessary to mention that even though the concept of S3 has only recently emerged but today, it has become a major awareness behind the European Commission's cohesion policy reforms especially in the field of regional innovation strategy (RIS) (Guerrero & Urbano, 2011), (Kotnik & Petrin, 2017). Therefore, to tackle the challenges of regional development, the foremost purpose is Smart Specialization must be implemented by European Union member countries to attain the highest competitiveness and innovation levels possible. In this respect, the idea of smart specialization strategy has been realized as the leading concept for formulating strategic goals and measures related to regional competitiveness. Similarly, it is to be noted that from policy context point of view, the notion of Smart specialization ranks at the top of public policy agendas in many European regions. As, this new strategic policy approach is gaining its attention towards the trend of ‘new industrial policies’. Hence, Smart specialization puts the impression of innovation as an important concept and applies an innovation-based development strategy for regional economic development by concentrating on each region’s specific strengths and competitive advantages (Moodysson, Trippl & Zukauskaite, 2017), (Rodrik, 2004). Accordingly, the consequence of this study shows smart specialization strategies inventiveness is influential instruments to foster and develop knowledge-development societies competitiveness, regional innovation and provincial growth due to their intrinsic competence. Therefore, conducted research emphasizes the significance of a high level of implementation of activities in the area of linking different firms, people, and knowledge at a regional level as critical factors that support the region’s entrepreneurial ecosystem to achieve their mission for the successful regional economic development. To improve the regional competitiveness, S3 has become a challenge today and it enable regions and organizations to find out the way to enhance their existing resources competitiveness, regional value, (i.e. human, knowledge, entrepreneurial spirit and social capital) and survive in this dynamic world. Regional Economic Development: It is the process of economic development of a region through which a region is capable to improve its economic, political, and social welfare. Nowadays in the regional science this term is often used by the academician, policy-makers and regional development agency people to indicate the growth of a region. Competitive advantage: It is a specific condition and a situation during the development phase of a region, which places regions to be in a very promising circumstances to manage their difficulties and gain a favorable business position. Regional Innovation Strategy: It is an emerging technique for developing territorial growth that enhance regions effectiveness and proficiency in the area of innovation. In this chapter, it is grounded in the policy context of technological knowledge development based on convenience, competence and creativity. Entrepreneurial Discovery Process (EDP): EDP is one of the core element of smart specialization strategy(S3). It is the bottom-up approach of S3 that region’s capability to maintain and gain market opportunity. In this chapter, EDP is linked to regional knowledge development capability. Entrepreneurial Universities: It is a commercially important institution that fosters existing resources (i.e., human and social capital) in order to link up with the relevant industry collaboration and strengthens regional economic growth. Smart Specialization: A new analytical, pragmatic and modern policy approach of regional development. It facilitates regions to overcome their drawbacks and enables to strengthen their potential capital resources that foster new business opportunities. Cluster Initiatives: The appearance of cluster concept is a quite new phenomenon that mainly deals with the regional networking, research and development, innovations, business promotion that facilitate mutual cooperation among competitors, and ultimately lead to the achievement of numerous positive effects for the region. Cluster is based on the local network which has the character of a specialized division and cooperation. Cluster initiatives accelerate the regional growth.